IDS includes an optional bulk email module, which allows you to send the same emails to multiple recipients simultaneously and to track the results. A comma or tab separated file generally acts as the data source for the emailing, although we can customize your system to use any data source. This file contains the name and email address of each person to be emailed, along with any other specific information necessary to customize the email. Once this file has been imported into the bulk email screen all of its fields can be accessed, allowing you to perform mail merges to customize the email as it is sent to each person. Attachments can also be included with each email, along with a specific footer and reply to address. Each bulk emailing may be associated with a particular user definable topic. This is extremely useful if you want to track who each mailing was sent to at a later date. If you have any links within the email, they can also be tracked through the same user definable topic. Whether you create an html page in another editor, or type code or text directly into the email message text area, the bulk email option provides you with many options to easily ensure the email message is formatted properly. A user definable delay is included between the sending of each email to allow the process to work with all levels of email servers. 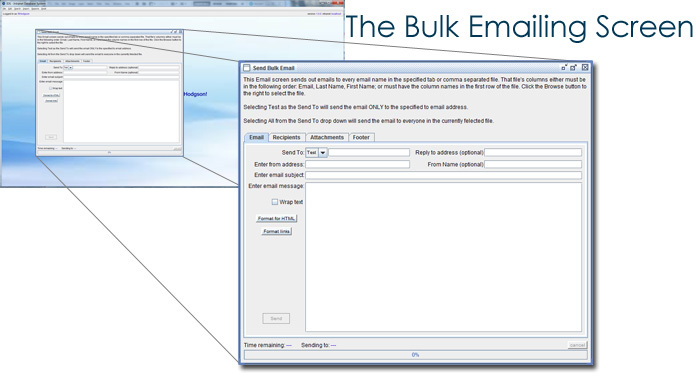 The progress of the bulk emailing is monitored and displayed along with the ability to cancel the emailing at any time.